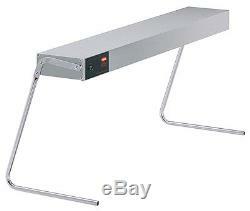 Hatco GRAH-24 Glo-Ray Infrared High Wattage Food Warmer - Legs Included. 500W Glo-Ray 24 food warmer Continuous aluminium housing Maintains optimum serving temperatures Safely holds food temperature without drying out Heat pattern covers the entire surface Insulation minimizes heat loss Factory assembled with mounting tabs, ready to install Legs included Reflector does not blacken, Ensures maximum flavor, safety and holding time Maintaining a consistent, even heat pattern. Metal sheathed heating element guaranteed against burnout Protective wire guards under heating element. Portable for event catering Heavy duty insulation minimises heat loss Standard brackets provided Factory assembled with mounting tabs Toggle on off switch, aluminium material Weight 4kg, packed Electric 13A, 500kW, 230V, UK plug H64 x W610 x D153mm. Hatco's Glo-Ray aluminum infrared strip heater blankets food holding areas to safely hold products at optimum serving temperatures, using a pre-focused heat pattern and specially-designed reflectors to ensure maximum food holding. A portable heating unit that is perfect for mobile and event catering thanks to its light weight and trouble-free operation and the supporting C leg stand provides stability for the device without taking up much space. 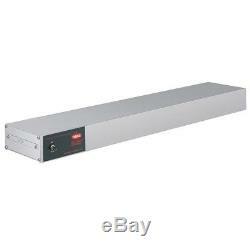 A great selection of Hatco's strip light heaters is available from our online shop. 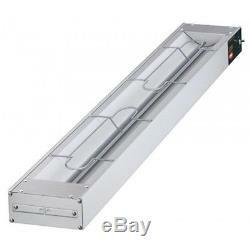 The item "Hatco GRAH-24 Glo-Ray Food Warmer Legs Included (Boxed New)" is in sale since Wednesday, August 10, 2016. This item is in the category "Business, Office & Industrial\Restaurant & Food Service\Kitchen Equipment & Units\Lamps/ Warmers". The seller is "cateringhygienespecialistsltd" and is located in Uxbridge, Middlesex. This item can be shipped to United Kingdom, Austria, Belgium, Bulgaria, Croatia, Cyprus, Czech republic, Denmark, Estonia, Finland, France, Germany, Greece, Hungary, Ireland, Italy, Latvia, Lithuania, Luxembourg, Malta, Netherlands, Poland, Portugal, Romania, Slovakia, Slovenia, Spain, Sweden, Australia, United States, Canada, Brazil, Japan, China, Israel, Hong Kong, Norway, Indonesia, Malaysia, Mexico, Singapore, South Korea, Switzerland, Taiwan, Thailand, Saudi arabia, South africa, United arab emirates, Ukraine, Chile.